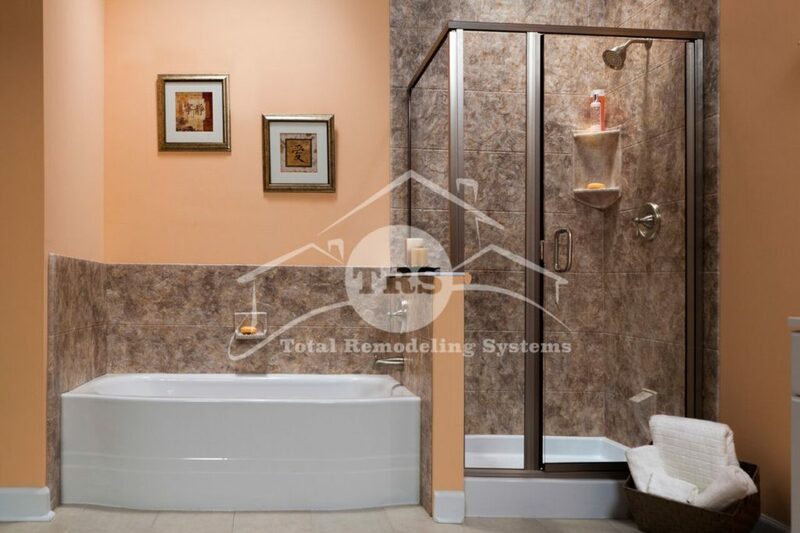 At Total Remodeling Systems, we take on replacement tub and shower installations as complete bath systems. This means that no matter the shape or style of your tub or shower, our systems come with the complete enclosure for a new bathtub or shower with base, wall surround, plumbing installed by our in-house experts and your choice of fixtures. Instead of considering a liner or insert, or taking on a bathroom remodeling project yourself, let our team handle the job so you’re left smiling after our work is done. Because no bathroom is the same, all of Total Remodeling Systems’ replacement tubs and showers are unique. One of the benefits of choosing our bath systems over a liner or insert is that in addition to getting the bath enclosure, which includes the base and wall surrounds, you also get the new fixtures for your replacement shower or tub, giving your bathroom a clean, new look. We are Total Remodeling Systems. We serve you, Virginia, West Virginia & Maryland, with the most complete line of spectacular home additions. From Frederick County all the way to Richmond, including Alexandria, Fairfax, Ashland, Leesburg, Baltimore, Chesterfield and Fredericksburg, our experienced team can help you create the bathroom of your dreams. From walk-in and safety tubs to replacement showers and more, the bathroom remodeling experts at Total Remodeling Systems, located in Winchester, VA & Ashland, VA, are ready to take care of your space. WHY CHOOSE TOTAL REMODELING SYSTEMS? Our bath systems include Antibacterial Technology, which keeps your tub or shower clean by eliminating organisms that cause mold and mildew. Skip the headache of working with multiple companies or sub-contractors. All of our skilled team members are in-house and our installers are certified. At Total Remodeling Systems, we stand behind the quality our replacement tubs, showers and bath systems, which is why we offer a lifetime warranty on parts and labor. Don’t deal with a renovation that causes your bathroom to be unusable for days. Our installation experts usually complete bath remodels in one day.